It has a detachable screen, Surface Pen, Intel ‘Skylake’ dual core processors, and Windows 10 Professional on the OS front in the lower model. By shelling out some extra money, the tech giant offers Nvidia based discrete GPU for about $1499. 1.3 Will It Beat Its Rivals? Despite a lot of good hardware specs, it had a few hiccups. There were complaints regarding the Dynamic Fulcrum Hinge which induced a space when closed. Lower battery life to its competitors and steep pricing for higher end specifications were some other complaints which surrounded it. Keeping the previous gadget to its place, let’s move on to the upcoming product. As of now, Microsoft hasn’t officially announced the launch date as it has been only a year since the launch of its original product. However, it’s definitely clear that the successor is in progress. It is anticipated that it will be released along with Surface Pro 5, Surface Phone, and a Surface all-in-one PC. The above tech products are expected by the firm as the Microsoft’s second Redstone update (RS2). It will come out on the anniversary of this summer. It would be more beneficial to users if the company releases the upcoming device with the all new Intel’s next generation Kaby Lake processors. This 14-nanometer microprocessor architecture is expected to go for high volume production at the end of 2016. The processors will offer USB 3.1 Type-C and Thunderbolt 3 support along with the regular four cores’ configuration and improved CPU / GPU performance. Microsoft recently unveiled its Play Anywhere program and it’s still not clear if the company will be including it with the hardware of upcoming Surface Book. The year 2017 makes it a perfect time to launch an additional gaming focused configuration with a GeForce 980M. Stay tuned for latest updates regarding it. Leave it to Microsoft what it gives with the all new 2-in-1 laptop. There will always be improvements which can be done. And it will even if the company gives their best. Below are some of the ideas from us and some readers to make a better Windows 10 laptop Take a look and if you want to add yours, let’s know via comments. Latest Intel Kaby Lake processors will be required to power the next HD screen for the SB 2. The previous model has a 13.5-inch display screen with a 3,000 x 2,000 resolution pixels with 267 PPI. Moreover, there is an integrated Intel HD Graphics 520 GPU. The new model should offer a 4K screen. The upcoming Kaby Lake architecture of Microsoft processor will improve the playback of 4K video and 3D graphics. Along with it, the company should focus on providing a better with which the screen can be detached from the keyboard. There are a lot of complaints regarding the hinge mechanism in the original SurfaceBook. As of now, it both requires electricity and mechanical process to detach it. It’s both software and hardware based process. So, there can be an unforeseen glitch in the system. There must be a better way for it. It should get detached irrespective of the system is ON or OFF. If Microsoft includes new Kaby Lake architecture, then the device will definitely need more power as the screen resolution will increase. With this, we meant to say that there should be enough battery to power the device with improved performance. With tests and normal usage, original Surface Book has a 4-hour battery in the Clipboard and an 8-hour battery in the base. To watch 4K content, users will require more of the battery backup. It won’t be possible with the current specs. The built-in recharge dock for the Surface Pen will need an improved battery. As of now, the device has a standard AAA battery. However, a patent has made it clear that Microsoft is working on a stylus with a built-in rechargeable battery. This is, however, an old patent. But it can be possible if the company provides a rechargeable Surface Pen for SB2. As of now, Microsoft’s focus is on providing a better stylus in Windows 10. The new pen should have a LED indicator light and a power button. The updated GPU will need more power. The current device can include a Nvidia GeForce graphics chip with Maxwell architecture which has a thermal envelope of up to 75W. If Microsoft comes up to give Nvidia GeForce GTX 980 graphics chip, then it will need to support power requirements of up to 145 W. Its alternate is to use slower GeForce GTX 980M with 100W and it will still support DirectX 12 in Windows 10. But it will still need more juice. It would be great if it comes out VR-ready. For it, the laptop will need to have two USB 3.0 ports, a mini Display Port, and an SD card reader. With it, it should have an HDMI 1.3 port to support 297 MHz clock by a ‘direct output architecture.’ It means that the external video output pumped through the HDMI port can’t be locked to the performance of the laptop. It should have 128gb to 1TB internal storage. It should cost from $1500 to $3500 depending upon the specifications. 29th August 2016: Microsoft posted an image on Instagram to tease, it wasn’t a teaser at all. 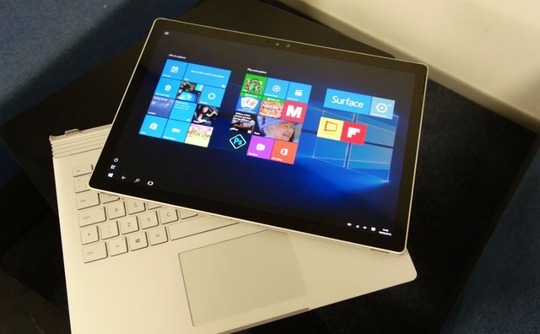 It was a cropped photo of original Surface Book. Will It Beat Its Rivals? Despite talking what should it have and when it releases, there have several rumors that it will be released this Summer with Surface Pro 5 and Anniversary update. It is still not in the market to beat Apple MacBook Air 2016 and MacBook Pro 2016. The devices of Microsoft are still young, and the follow-up models will take time. This is all for now. Let’s see if there are any easter eggs in the Windows 10 Insider Preview builds regarding hardware. It seems that the company has bigger plans for Redstone 2. Most of the people are still hoping for an early 2017 release for SurfaceBook2. Let’s wait and watch what happens next as 2016 comes to an end.